Will Google Reader Give You Your Attention Data? There has been some buzz this week about the new trends feature added to Google Reader. It is a nice feature, and it will be even better once it includes aggregated trends of all Google Reader users. Being able to see the feeds you pay the most attention to is great, but it’s equally great to see what everyone else is paying attention to (and of course, data about what large numbers of people are paying attention to is incredibly valuable to both publishers and advertisers). The data about these aggregated trends belongs to Google, which seems fair enough to me. But what about your individual attention data? Should Google own the information about what you are paying attention to in Google Reader, or should they give it back to you? And yeah, I know, the fact that this blog post is written by someone who kinda-sorta competes with Google Reader automatically makes it suspect. But quite honestly this goes beyond my role as the developer of FeedDemon. As Touchstone’s Chris Saad points out, FeedDemon has shown your attention data for quite a while now, and I’m pleased to see the importance of attention spread to other aggregators. I’ve written about attention data many times in this blog, including in this post which begins the conversation about including attention data in OPML. Not much has happened with OPML+Attention since then, but perhaps we can jump start the conversation again? 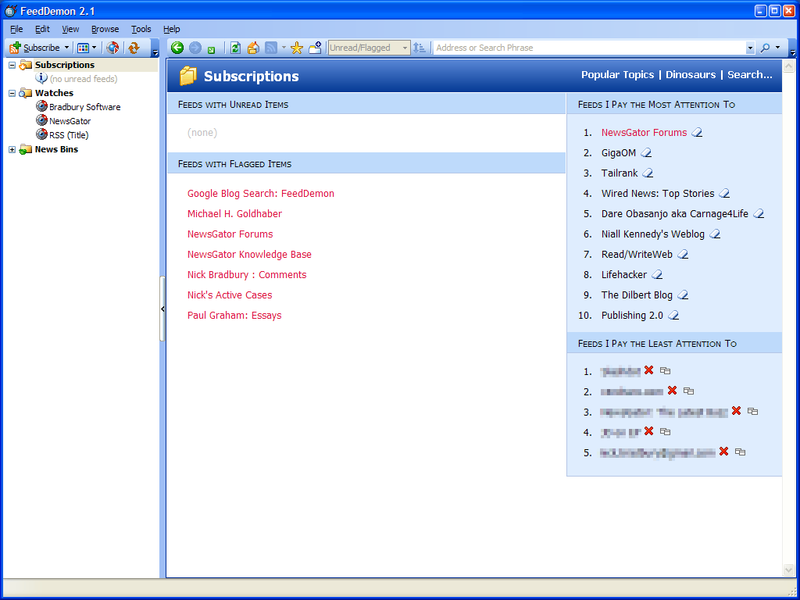 Google Reader – like every aggregator – supports OPML import/export. So Google Reader folks, why not include your customers’ attention data in your OPML export, and support it in your OPML import? Nothing fancy is required here – a simple feed rank would be a nice start. OPML may not be the most precise format, but we’re all using it, so it seems like the obvious choice for sharing attention data between aggregators. But if Google chooses another format, that’s fine – I’ll use it, too. The important thing here isn’t the format, but whether or not Google is willing to give its customers their attention data. Previous What’s Coming in the Next FeedDemon? It’s general Google policy to try not hold user data hostage, and we on the Reader team try our best to abide by that. In this case, exporting of attention data is a rather murky concept since there doesn’t seem to be a commonly accepted format for it. With the help of the continuation token in the response, you can fetch your reading history all the way to the first item you ever read in Reader. Atom is a widely accepted format, so it shouldn’t be too hard to write an importer that will slurp your Reader history. This is definitely an interesting topic, that will become more and more important as people spend more of their time in applications like aggregators. We’ll be watching the developments closely. Thanks for the response, Mihai. You’re right that exporting attention data is a murky concept due to the lack of a common format – addressing that was actually one of the reasons for my post. I wasn’t aware that Google Reader exposes recently read/starred items as Atom feeds. That goes a (very) long way towards giving customers their attention data in a format that other applications and services can import, so you deserve some kudos for supporting this. But for an end user who simply wants to move their feeds from one aggregator to another, this is actually too much information. The new aggregator may just want to know which feeds the user has paid the most attention to, which is why I’m suggesting adding a simple “rank” attribute to OPML outline nodes. While it’s true that a feed’s rank is derived data, I still consider that part of the user’s individual attention data. Previous conversations about this concluded that rank should be a float with a range of 0 to 1. I know that seems like an overly-simple solution, but it strikes me as a good place to start. BTW, if you’d like to contact me privately about this, feel free to drop me an email at nick-dot-bradbury-at-gmail-dot-com. It’s great that this is coming up again. As some of you might know we are gathering a workgroup to create a standard spec for Attention Profiles – we call it APML (www.apml.org). As Mihai suggests (and Nick you affirm) there is a specific difference between Attention Data and derived information (what we call Attention Profiles). At Touchstone we consider ‘attention data’ as anything you leave behind that indicates your actions or interests. OPML, browser history, attention.XML, documents, IM chats etc. But most of this information is too high resolution or private and is not practical to export and import on a regular basis. So to try to alleviate that problem, APML does not propose to store all the granular attention data; only derived interests and feed rankings. How are they derived? Well that’s where vendors can innovate. We are taking the lead by developing technologies that convert attention data to attention profiles in APML and compares incoming feed items against attention profiles to generate a value for “Personal Relevancy” – sort of like a personal PageRank for incoming feed items and alerts. Though playing devils advocate why doesn’t someone fork the attention trust recorder and build a Firefox extension that records your attention to a 3rd party service? Well that’s what the Attention Recorder does. However Feeddemon and Google Reader and your email client and your IM logs and your browser history already store plenty of attention data at the moment. So great… we have plenty of attention data. The question is – how do you apply that data to create a profile – and then how do you create a profile to create value for the user (by filtering, ranking, recommending etc). And how do you do it in a portable way – and not necessarily stored with a hosted service. Personal attention data is simply not very valuable, since the situations in which someone needs to review what they themselves have been doing are far more rare that instances in which people would like to know what others are doing. Have you ever heard of someone doing market research on themselves? I would write more, but I have to review my list of what I ate last month to decide what might taste good for dinner. I dont get why a common person would care about what they’ve been paying attention to for the past year. If I’ve forgotten what I was reading last January, I probably don’t need to recall it. Besides, thats what “Favorites” in IE are for. In addition, why would I want to give some 3rd party service (attention recorder) access to all that information? That’s like intentionally running a key-logger spyware app on my PC. Dave & Z, simply showing a person what they’re paying attention to (like FeedDemon currently does) probably isn’t that useful to many people, but it is something that other more useful features could be built off of. Once you know what people are paying attention to, you can do more to surface the information that’s most valuable. I would argue, though, that showing what you’re paying the *least* attention to is valuable, since it enables you to figure out what information (ie: feeds) you can get rid off.